Please note, product now includes reagents for enzyme-based fragmentation. 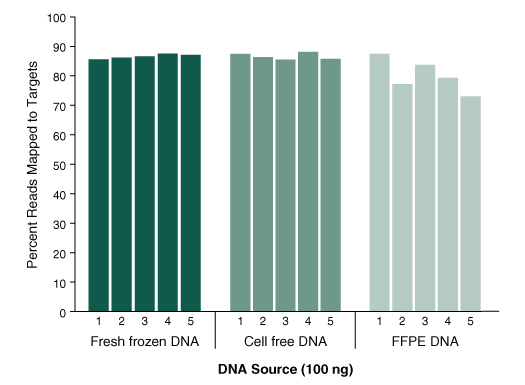 The NEBNext Direct® Cancer HotSpot Panel employs a unique hybridization-based enrichment workflow that hybridizes baits directly to genomic DNA, without the need for upfront library preparation. The NEBNext Direct Cancer HotSpot Panel is designed to enrich for DNA fragments across 190 common cancer targets from 50 genes, encompassing approximately 40 kb of sequence and including over 18,000 COSMIC features. 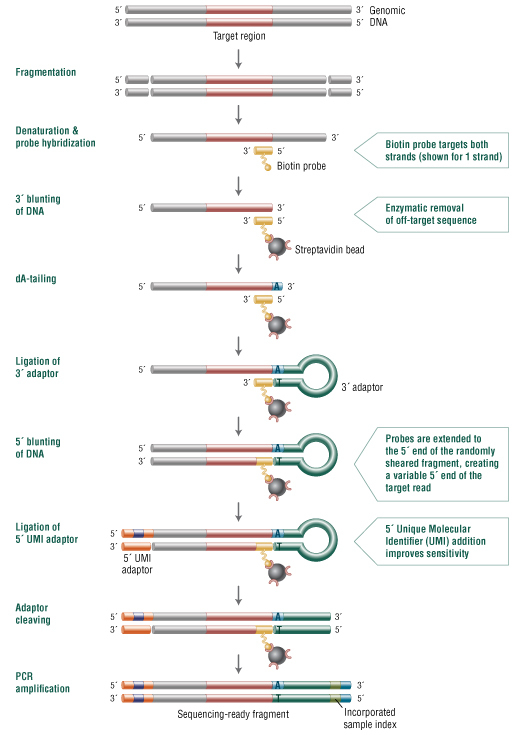 This kit contains the oligonucleotides, beads, enzymes and buffers required to convert the desired fragments into a sequence-ready library for next-generation sequencing on the Illumina platform and is designed for PE75 or PE150 Illumina sequencing. Figure 1. NEBNext Direct employs a fast hybridization-based workflow that combines capture with library preparation. Figure 2. The NEBNext Direct Cancer HotSpot Panel demonstrates the ability to accurately detect a range of nucleic acid variants. 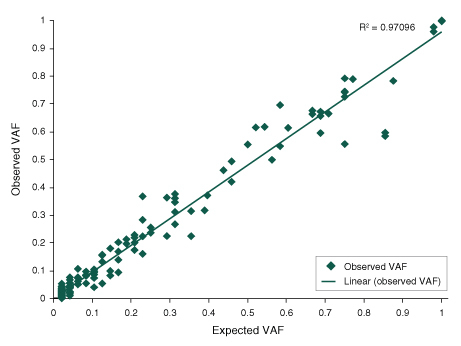 This figure shows the expected versus observed variant allele frequencies (VAF) across the range of well-characterized variants present in a pool of 24 HapMap samples screened against the NEBNext Direct Cancer HotSpot Panel. 100 ng of input DNA was used, samples were sequenced on the Illumina® MiSeq® using 2 x 75 bp sequencing, and standard data analysis and variant calling algorithms were used. We were able to successfully detect 100% of the 168 truth variants present across a range of 2-100% VAF. 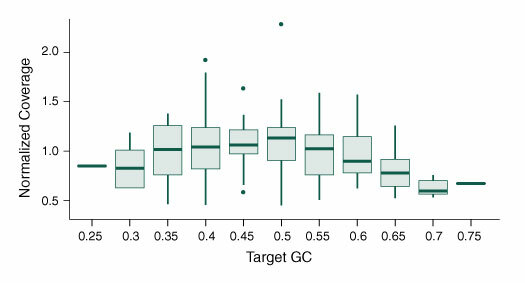 The high degree of linearity across this broad dynamic range demonstrates the ability of the NEBNext Direct Cancer HotSpot Panel to accurately predict variant allele frequencies across a broad dynamic range. Figure 3. The NEBNext Direct Cancer HotSpot Panel delivers a high percentage of sequence reads mapping to targets, even with challenging sample types. Figure 4. 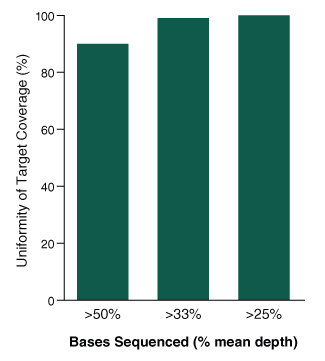 The NEBNext Direct Cancer HotSpot Panel displays high uniformity of coverage across targets. Figure 5. The NEBNext Direct Cancer HotSpot Panel offers minimized bias across sequence content. 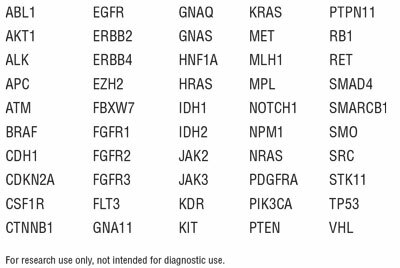 ILLUMINA® and MISEQ® are registered trademarks of Illumina®, Inc.
Where can I find the detailed FAQs for the NEBNext Direct™ Cancer HotSpot Panel (NEB #E7000)?